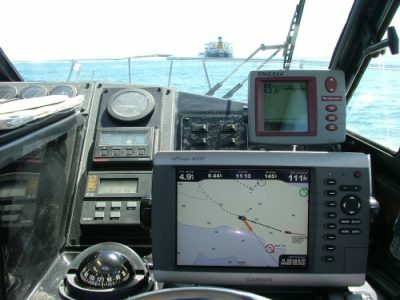 AIS (Automatic Identification Systems) are radio signals sent out by vessels indicating position, speed, heading, destination etc. The signals from these transponders can be picked up by an AIS receiver and the information overlayed on a chart plotter. The NASA AIS Engine is a "black box" unit, which receives these VHF signals and converts them to NMEA messages which can be read by a suitable chart plotter. Version 2 receives the Class A signals which all commercial vessels over 300 tonnes (and a lot of smaller ones) broadcast, and Class B which is for leisure boats. You need the AIS Engine, a standard VHF aerial, a BNC plug and this web site to explain what to do, because you won't find the NASA instruction manual, sorry - scrap of paper, much use. For some reason the AIS engine has a BNC socket instead of a standard VHF aerial socket so you will need a suitable 50 Ohm plug - a few pence from Maplins or a lot more from a chandlers. Any VHF aerial will do, although I chose to match my existing VHF radio aerial so I have a flashy pair. This is the easy bit. Find somewhere hidden, like behind the dash, and screw the unit to a bulkhead with two screws. Fit the BNC plug to the VHF cable and connect it to the unit. Add power (fused), and plug in the data cable. If your chart plotter has a socket to match the cable you are laughing, otherwise you will need to cut the cable and make your own connections. 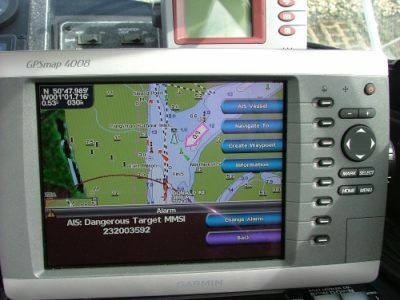 I connected the AIS engine to a Garmin GPSMAP 4008, which provides a number of NMEA ports for data in and out. Other chartplotters will have similar configurations. 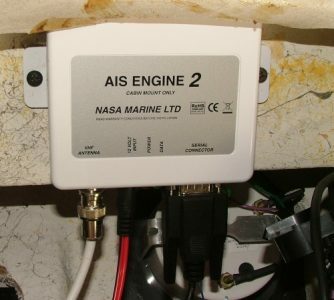 You will need to connect the AIS data cable screen wire to the negative of your boat wiring loom. The black wire is connected to the + wire of one of the NMEA Data In Ports of the chart plotter. 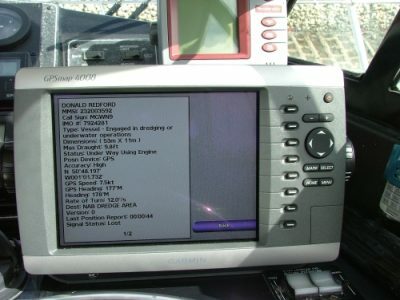 The - wire of the NMEA Data In Port is also connected to the negative of your boat wiring loom. That is all you have to do - solder and heat-shrink tube is the recommended method.The AIS engine has two LEDs, one for power and one for data. If red is on and green is flickering, you know that bit is working fine. Again, easy when you know how. All you need to do on the Garmin unit is to tell it that the NMEA port you chose for the AIS signal is High Speed, then everything else is automatic. This vital snippet of information is well hidden in the Garmin manual so it had me struggling for a long time. This is a bargain, and an incredibly valuable aid to safety at sea. Many small boats do not have radar, but do have chart plotters. For about £150, you can install the AIS engine and aerial which shows more information about large vessels than a radar costing ten times as much. It will not show vessels that are not using AIS, nor will it show other hard things which radar will, but for most of us fishing near busy commercial ports it is invaluable. I can think of at least one tragedy that happened recently off the Isle of Wight that could almost certainly have been avoided if the casualty had had access to AIS data at the time. Manufacturers information is on the NASA web site. The price at the time of purchase was £119.00 from the Marine Superstore, Port Solent.